The IIHS in 2010 declared all quarter panels to be irrelevant to safety, and it repeated this assertion in its recent Feb. 15 advisory related to attorney Todd Tracy’s crash testing of a 2013 Honda Fit. But the sweeping description — accompanied by no evidence of quarter panel testing either year — seems to confuse the issue for quarter panel components which are structural. Experts suggest the parts can go either cosmetic or structural. 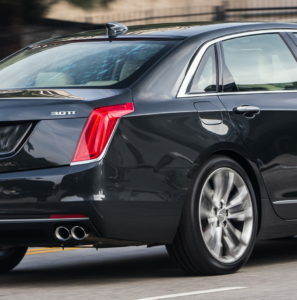 GM, for example, has publicly declared the quarter panel structural on at least the Cadillac CT6. A 2010 Hammer & Dolly article by P&L Consultants co-owners Larry Montanez and Jeff Lange states that while repairers should check OEM position statements on what parts are defined as structural, automakers might not always provide a clear answer. But based on definitions of structural auto parts from I-CAR, the IIHS and the Society of Automotive Engineers, repairers can typically consider quarter panels structural given their role in at least one of three factors: managing collision energy, managing road shock or supporting the vehicle’s weight, according to Montanez and Lange. I haven’t seen much published documentation from OEMs identifying quarter panels (or any other parts) as structural (or non-structural). FCA has a non-structural repair document that includes quarter panels; JLR identifies structural repairs as anything welded, but doesn’t specify the parts as one or the other; in courses we’ve worked with OEMs on (Ford, Nissan, and Honda), they don’t identify any parts as structural or non-structural. We, long ago, stopped using the terminology also, when discussing parts. We discuss “parts of the unitized structure” which includes quarter panels, but we also cover quarter panels in “exterior panels” publications/courses. Asked about the IIHS characterization of quarter panels as always being cosmetic, IIHS Chief Research Officer Daid Zuby said that whether one is structural or not depends on how it’s integrated into the underlying body. “It really all depends on how that stuff is tied together,” he said. Similar construction principles might alter whether something like a fender would be classified as cosmetic or structural, he said. A fender “just hanging on a frame rail” wasn’t structural, Zuby said. However, one welded and integrated into the rail, A-pillar and firewall “could become structural as well,” he said. He also observed that for some carbon-fiber cars, it also “becomes less clear” what is and isn’t structural.